Solar fountain pump. It consists of high-efficiency solar panels and high-power pumps. This is something attractive to the fascinating bird. This solar panel is made of high quality polysilicon. This is a waterproof product and an indispensable pump for your garden. The kit has four different nozzles that can easily change the height of the water. General water rises to about 30-50 cm. 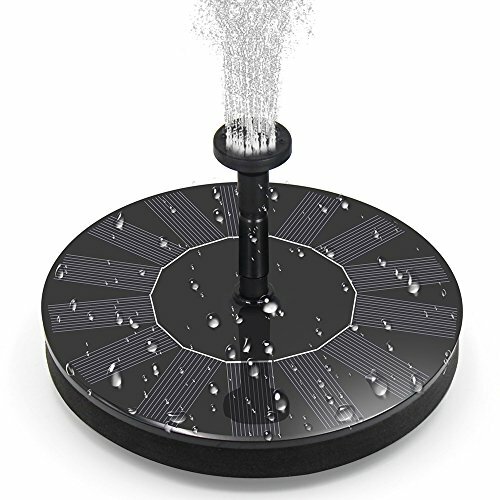 This is an eco-friendly solar fountain pump that does not require batteries. The solar fountain pump is ideal for your garden and patio decoration, attracting the attention of passers-by or enjoying this fantastic, fun life in the privacy of your backyard. 2.Place the solar panel in a suitable place to ensure that it is not covered by other objects. When the solar panel receives sufficient light, the pump works normally. 3.When the pump is just put into the water, there is air inside that may affect the water spray effect. It is advisable to connect the spray head after the water pump is normally sprayed. 4.The pump can be disassembled and cleaned regularly to extend the service life of the product. 1.Before using the solar fountain pump, remove the film covering the solar panel to work at maximum efficiency. 2.Place the solar water fountain under enough sunlight to keep the energy working because the solar panels depend on the sun and they are affected by the weather. 3.Make sure there are no shadows to block solar panels for maximum potential. 4.Do not allow the pump to work for a long time without water, otherwise it will shorten the life of the pump. Environmental protection and energy saving: This solar fountain pump is driven by sunlight and can work automatically when the sun is full. The solar pump is completely environmentally friendly and does not require battery or electricity. This is an environmentally friendly solar pump. Different nebulizers: It is equipped with several nebulizers, you can mix them freely, and use different nebulizers to spray different nebulizers. However, we recommend cleaning the bottom of the pump regularly to prevent it from being clogged with any debris. Multiple applications: This eco-friendly solar fountain pump is a perfect complement to any bird bath, fish tank, small pond, swimming pool, garden, oxygen water cycle. Your garden will definitely attract the attention of passers-by. Let your yard look so magical solar water pump decoration. 100 Money Back Guarantee: If you have any questions, you can contact us by email and we will solve all your problems, including refunds or replacement services, so you can buy with confidence! ! ! If you have any questions about this product by RuiXiang, contact us by completing and submitting the form below. If you are looking for a specif part number, please include it with your message. Care Free Enzymes 2-Pack Canary, Finch & Parakeet Bath Protector 94004 33.9 oz. Care Free Enzymes 3-Pack Canary, Finch & Parakeet Bath Protector 94003 16 oz. Care Free Enzymes 2-Pack 3B Protector Spray Bottle 94721D 16 oz. Care Free Enzymes 2-Pack Birdhouse, Nesting Pocket & Gourd Cleaner Spray Bottle 16 oz.